The past few years have seen a number of upstarts hit the Wi-Fi scene, bringing new approaches to shake up the status quo. Ignition Design Labs (IDL) came out of stealth at CES 2016 to reveal technology aimed at enabling easier access to DFS channels. I covered the whys and wherefores on this in my CES 2016 wrapup, so won't repeat it here. In addition to pursuing OEM deals with service providers and others, IDL decided to spread the word about its technology more broadly by fielding a consumer router. IDL's Portal started life as a traditional single point router. But its makers saw the Wi-Fi "mesh" handwriting on the wall and decided to incorporate that technology shortly before it started shipping late last year. So you can buy it as a single router ("ideal for most homes and apartments") or a two-pack ("best for very large homes"). Prices have come down on both and are currently at around $179 for one and $319 for two. Portal comes in a comparatively large glossy white plastic box that sorta reminds me of a (really big) squashed jelly bean. Although it doesn't scream Router! by bristling with antennas, it's large enough to call attention to itself. There is only one light (the "O" in the portal logo) on the top uses colors and blinking to indicate status. When everything is okey-dokey, the "O" is lit with a subtle solid green. All connections are on the rear as shown below. All the ports are Gigabit but the USB ports are 2.0. At least they can share an attached drive, unlike all other distributed Wi-Fi systems (DWS) to date. Both FAT and NTFS formatted drives are supported, but only the first partition for now. The bottom cover has plenty of cooling slots, but there are none on the top or sides. Despite this sub-optimal design, Portal's top didn't get noticeably warm. The bottom cover also has wall-mount slots that let you hang Potal so its connectors point toward the floor. IDL didn't play cute with Portal's FCC internal photos, which allowed identification of all key components. The view below with the bottom cover removed shows why all the air vents are on the bottom cover. The top side of the board has RF cans, but no heatsinks. The three larger antennas are for the 3x3 2.4 GHz radio; the four smaller are for the 4x4 5 GHz radio. This combination makes Portal an AC2350 / 2400 class router. There is also an eighth antenna that sits up near the logo beneath the top cover. This connects to the "secret sauce" module that I'll describe shortly. The next view shows the heatsink and RF can tops stripped away to show the 2.4 (right) and 5 GHz (left) radios. The empty connector between the two radios holds Portal's "secret sauce" module (my term, not IDL's). One of the photos in the FCC internal pictures file identifies this module as "2.4G/BT/BLE Module", but it's much more than that. The composite photo below shows both sides of the board, which are packed with interesting goodies. In addition to a CSR8811 Bluetooth 4.1 SoC, it also holds the Qualcomm dual-band monitor radio and dedicated Qualcomm "SpectrumBoost" co-processor that enables Portal's "zero-wait" DFS switching. This monitor radio, plus associated cloud intelligence, lets Portal switch quickly back to the same DFS channel it vacates if radar is detected. Other routers that support DFS and don't have continuous monitoring must disconnect clients and listen for radar for a minute before resuming operation. The vacated channel must also be left unused for 30 minutes. Both requirements put a pretty big crimp in most routers' ability to use DFS channels, which is why (plus the additional FCC certification process) most products don't bother supporting DFS. Surprisingly, IDL doesn't talk about this much on their website, instead touting its "FastLanes", which is IDL's marketing term for all this. The component summary below shows the key components for Portal, Luma and eero. The comparison makes for an interesting study in how the three companies approach the design of mesh-capable nodes. 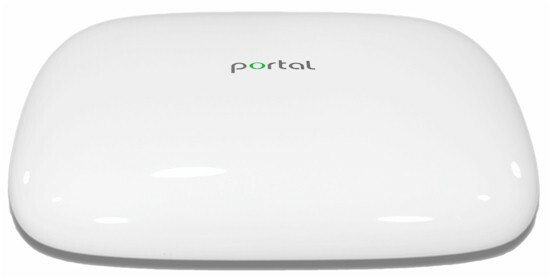 Although its radios handle both client connect and backhaul duties, Portal is the only DWS product with a client-facing 4x4 5 GHz radio. Portal says it supports MU-MIMO on that 5 GHz radio, but I didn't check MU-MIMO operation. But since it's Qualcomm-based, it should support MU-MIMO devices just fine.